Atrophy is a 2012 mystery novel by Sean Danker-Smith. It is an indirect prequel to his previous novel, Harbinger, and peripherally features the protagonist from that work. Here, a social worker with a mysterious paramilitary past searches for a missing colleague. Atrophy’s biggest strengths are its atmosphere and setting: the city of Silver Bay is almost a character unto itself. This provides the reader with a vital level of immersion and contributes to the hard-boiled, slightly Chandleresque feel the book often has. The protagonist is something of a curious character. Velvet isn’t an unreliable narrator, as least as far as events are concerned (mostly), but she’s prone to extensive introspection and self-evaluation, and she’s rather terrible at it. Yet she periodically compels herself to act according to who she thinks she is or should be rather than who she wants to be or actually is. This is an interesting choice by Danker-Smith, as by the end of the book, she’s become a somewhat less sympathetic character. The ending, which isn’t completely satisfying (a not-insignificant amount of resolution is left for future books), also feels markedly wrong – at least at first glance – as it involves Velvet taking some extreme actions without being self-critical afterward. Yet this can also be construed as a major evolutionary step for her character of which she may not be aware. This turning point of hers is potentially quite interesting, and warrants the further development that it does not receive here in future novels. Atrophy is the sort of story where characters show up and phone calls are received, promptly and as needed, to move the plot along. I can’t fuss about that too much, though, as this has been a tried-and-true mystery storytelling method for decades, and Danker-Smith makes the pace more than brisk enough to prevent any serious complaint, even if the story mostly seems to just coast along. But it always generates plenty of mystery, if not a good deal of suspense. Atrophy was originally written as a serial for the web, and some of the seams are still showing, although it’s been tightened up tremendously since then. There are a number of good story elements here, but they don’t always play well together. Some scenes and elements feel out of place altogether; some seem to be there only to tie into other books in what is intended to be a rather lengthy series. I can’t attest to their real-life accuracy, but most of Velvet’s conversations with the psychiatrist are jarring, as are many of the pop culture references. 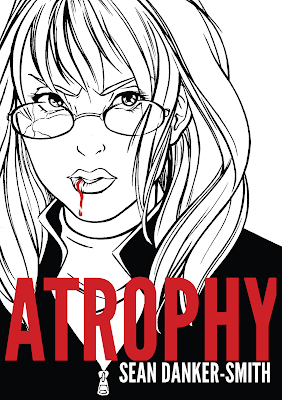 In the end, though, in spite of some flaws, Atrophy is, for the most part, an entertaining, page-turning mystery.